Discussion in 'General Discussion' started by Nadeox1, Oct 29, 2018. Please disable all mods and check again before reporting issues. That will help us a lot focusing on actual, real issues, instead of going after problems caused by mods. We would love to hear your feedback on the newest update! Please also keep the non-contributing discussions to the bare minimum, so that we can help users in need more effectively. Game crashes (or INVALID_CRUNTIME_PARAMETER) if 'Online Feature' is being enabled | Fixed for next hotfix (thanks a lot to @Rewzu for his invaluable help! )(Temporary solution) - Go to Documents/BeamNG.drive/settings/cloud and open the 'game-settings-cloud.ini' file with Notepad or similar. Find the line that contains 'onlineFeatures' and replace the whole line with 'onlineFeatures = disable' (without the ' ' ). Save the file and check. Thumbnail generator app not working correctly | Known issue, needs some major work to fit the changes to the borderless mode. Black graphical artifacts streaking across maps | Not a game bug, only affects AMD GPUs with latest drivers. See solutions below. (Solution #1) - We have been receiving reports from a user that this may have been fixed in the latest Optional AMD drivers (18.10 and newer). Please update your drivers, and press the 'CLEAR CACHE' button in the launcher to force the shaders to be regenerated. Let us know if this helped you! Customizable Engines and Drivetrains mod could break some vehicles | Remove/Disable mod and wait for 0.14 compatible version. Variety Mod can break some whole vehicle models | Remove/Disable and wait for fixed version. Note that this mod is already marked as outdated for quite some time. DJPloppers Megapack can break the Ibishu 200BX | Remove the mod and download the most recent version from the repository. Better Sounds Mod could break the game. | Remove and Clean Reinstall the game. Then wait for 0.14 compatible version. Parking Lights mod breaks the game | Remove/Disable and wait for 0.14 compatible version. Any mod that modifies game's core files could potentially break the game | Remove these mods and wait for 0.14 compatible versions. To report broken mods, use this thread or contact the author's of the mod directly. 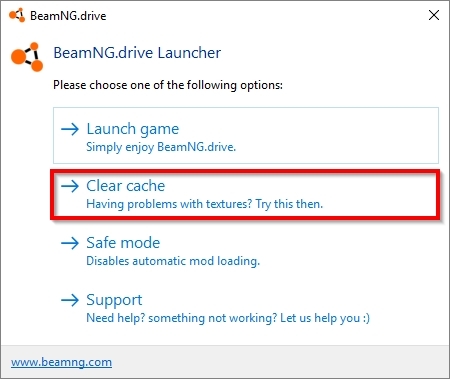 Launch the game and select 'Clear Cache' from the launcher. 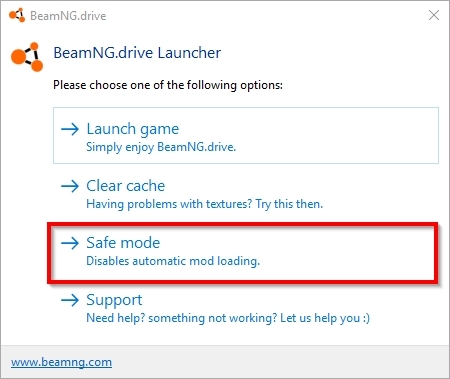 Launch the game and select 'Safe Mode' from the launcher. It will disable all your mods. Use it before reporting a bug, just incase your issue is caused from a mod and it's not an actual bug! Not played it yet but thank you for the update, have you ever wanted to illustrate crash tests for car company's? How are you accessing those tracks? From main menu? While inside another level? Variety Mod is quite outdated. The other is not, we will check what's happening there. Meanwhile thanks for the hint! EDIT: The DJplopper pack seems to break only the 200BX for some reason, other vehicles seems to work fine. EDIT2: We updated the DJplopper pack with a fix. If you have it, remove the old one and download the updated version! I use the W,A,S,D layout to drive the cars as it is the most comfortable for me on a keyboard. I got really angry (pun intended) when I jumped into the game today only to find out that with this new update, W and S is used to move the seat camera forwards and backwards. Please avoid binding commonly used keys to new features as this creates nothing but issues. Also: When I removed the binding, the seat got stuck in the position I left it in, it would be pretty nice if removing the binding would revert the seat position back to default. Are there any other mods known to cause issues with the game? I don't have both of these mods yet the game refuses to leave the Spawning Player screen. You are always better checking with all mods disabled. Reminder that issues caused by mods should not go here in any case, but if you know a mod that can cause game-breaking issues please feel free to let us know. WHERE!!IS!!THE!!GAVRIL!!V8'S!!FUEL!!SYSTEM!! Did you forget to model it, or does it really use throttle-body injection for some reason? Or am I missing something? UPDATE: I ran the numbers in Automation - the performance we're seeing from the Gavril V8 is actually quite feasible - maybe even a bit conservative - for a pushrod engine with TBFI and dual exhaust. However, the truck/SUV/van only have single exhaust! @B25Mitch, what's the deal? Maybe the trucks have bigger exhaust pipes? Why does West coast not have Halloween mode? WASDPgUP/PgDOWN have always been used to move cameras around. If you chose to change the controls and reuse the same keys for driving, you can move camera controls to other keys. Would that create any issues? Edit: Removing bindings shouldn't modify camera settings, instead you can click the "Reset seat position for all vehicles" button that's in the Camera settings menu. Normal. It's not included in the Halloween stuff this round. Oh. Is West coast usa gonna have winter mode this round? Thanks, so much good stuff in this update, it was actually as surprising as anticipated. Haven't had the chance to try it yet, but it looks very neat and extensive by just reading the patch notes. I changed it which was a minor annoyance to me but I got it all sorted in the end. I just find it weird that WASD keys are occupied by camera movement as I see them used for driving quite commonly among the people I know. Thanks for the reply, though.